Family Rooms have replaced the formal living room as the center of our homes. Most family rooms are located right off the kitchen so that you can visit with friends and family while you prepare meals. When you entertain, it seems that everyone gravitates toward the kitchen, so the having an open kitchen to a family room gives you great flow. Here are 10 Easy Tips to Add Color to Your Kitchen. Though it's simple to choose a color you love for the family room, if it's adjacent to the kitchen, you will have considerations in choosing the right color to flow between the rooms. A color can be chosen for both areas if you like to give the space an open and large feeling. Accent colors in the kitchen in surfaces and accessories can give that space more of its own look, while the family room furniture and decor can do the same. See the 7 Best Kitchen Paint Colors here. If you decide to use two different colors for an adjacent kitchen and family room, you'll want to be sure that they work well together. Sampling the color is essential, as each color will still need to relate to the nearby area and decor. Green paint color in your family room may not work with the red maple cabinets that suddenly look orange with that green color nearby. Pay attention to color undertones of any family room color you choose, as they can derail your color scheme with an unwanted color. Flooring, wood furniture, even the foliage outside, can create a conflict with your paint color. By learning about paint color undertones, you can learn to recognize and adjust for any color surprise when you sample your favorite paint colors. Behr Bermuda Grass MQ6-57 : Green is a great family room color. A warm and rustic green like Behr's Bermuda Grass works very well with Craftsman or lodge style architecture and decorating. Stonework and wood architectural details are highlighted against a rich green wall color. Accent colors for a rustic green family room can include deep warm red, rust, dark gold, and dark brown. 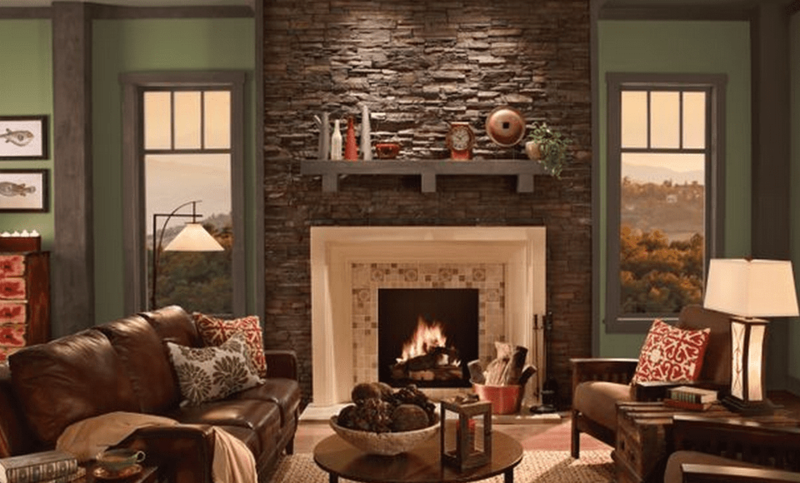 Behr Sienna MQ1-60: Behr's Sienna is the perfect choice for your family room if you like the idea of red, but find it too bright or strong for the space. Sienna is a softer red, with a hint of rust. If your family room is adjacent to your kitchen, a warm color like this can help tone down your overly red or orange wood cabinets. Accent colors for Sienna and other soft reds can include neutrals with gold undertones, warm beige, understated gold, and olive green. Sherwin-Williams Caen Stone SW 0028 : finding the perfect warm gold neutral is not always easy, but it's a perfect find for a family room. Sherwin-Williams' Caen Stone has the best qualities of a neutral color, with the warmth of gold. Accent colors for Caen Stone and other warm golds are plentiful. The best accents will be warm colors like rust, dark brown, and burnt orange. You can also add a cool accent in dark blue or green.